Back in the day, Hasbro used to include direct-to-consumer mailaway catalogs with each GI Joe figure. In 1992, they sent out "Terror on the Tundra," which, quite unusually, offered a new original character, rather than just the typical horde of re-releases. That was the origin of the Cobra Ninja Viper. Recruited from the highest ranks of the Cobra Viper corps, the Cobra Ninja Vipers are the most elite representation of ruthlessness in Cobra. Only the most sinister and cunning individuals are selected for duty as Cobra Ninja Vipers. They are no less than 10th level black belts in karate, jujitsu and kung fu. These villains are extremely obedient and always carry out their orders to the letter. They function as covert subversives who can "persuade" anyone to do their bidding by entrapping the person in one of their patented martial arts maneuvers. If given the opportunity, Cobra Ninja Vipers could wreak enough havoc worldwide to seriously damage the G.I. Joe team's operations. A rather obscure choice for a repaint, the Ninja Viper was originally just a seafoam green redux of Storm Shadow - the original evil Storm Shadow, not the later heroic version. This one changes things up, though: rather than a straight re-use of the G3 Cobra Storm Shadow, he gets his parts from a variety of sources. The torso is the same, but his lower legs, with their bamboo armor wraps, come from one of the comic packs, and his arms are the retooled Duke versions seen first on Doc. His head comes from the Joe Storm Shadow, so he's got a real hood, rather than just a form-fitting mask. The blue chosen for his uniform isn't exactly stealth-friendly, but it is true to the '92 figure. His belt is white, and he has a red Cobra symbol on his chest. In order to set him apart from the two Stormies released before (to say nothing of the Ninja Ku Leader), he doesn't have any kind of sash, just the belt. 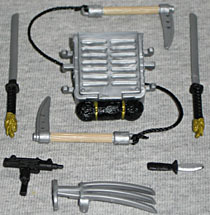 All the Ninja Viper's accessories come from the same comic pack that gave us his legs. Well, minus the dagger tucked into his belt, which has been a mainstay of this mold since it was introduced. The new(er) pieces include a large backpack that can store the two dragon-headed swords; a pair of kama connected by a cord; an Uzi; and a claw. That last one is often refered to as a "climbing claw," but it's not: climbing claws fit into the palm of the hand, not jut off the back like Wolverine. The backpack itself opens, and the Uzi can store away inside. 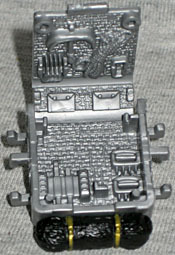 The interior is detailed with many more (non-removable) weapons, including a grappling hook, a coiled rope and some actual climbing claws. Surprisingly, the paint on this version of the accessories is better than the original release: there are more apps overall, bringing the pieces to life. Look at the kamas, for instance, which now actually appear to have wood handles, matching the sculpt, rather than being silver; the backpack itself used to be solid black, but now it's grey with black and gold apps for the (removable) rope underneath it. The Ninja Viper was a very unexpected selection for the G3 treatment. Yes, there were a few people requesting him, but mainly as an "I can think of a more obscure character than you can!" kind of deal. You know how it is. That's at least part of why it's so shocking to see that Hasbro didn't phone this one in at all: he's more than just a glorified repaint, offering pieces (both costume and accessory) that are otherwise rare. Sure, there are lots of figures that should have been updated before the forgotten little Ninja Viper, but that doesn't undercut his value in the slightest.